Bob Cantor has been a clinical psychologist in San Francisco since 1973. He was an Associate Professor on the full-time faculty of the University of California, San Francisco for ten years. Art and sculpture have been a life long passion. He has also published two books: "And A Time To Live" (1980, Harper and Row, nominated and a finalist for the Pulitzer Prize) and a novel, "Of Struggle and Flight" (1990, Little Viking). 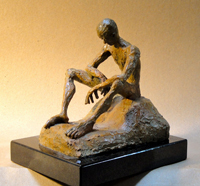 His prize-winning sculpture has been collected throughout the United Satates; featured in the 2005 Spring issue of "Direct Art Magazine", and awarded a coveted place in 2006's "Best Artists of California". My creatures seem to have a life of their own. As soon as they are standing up, I just follow their plan: Wrapping, painting, and sparkles, Lots of shapes and always stories. The materials used are: Brightly colored fabrics, wire, polymer clay, paint, beads and sequins. I am awed by the interconnection of all life. I love all creatures and this earth they live upon. 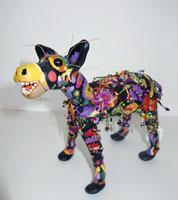 Lisa Clarke crafts each piece of art, layer by layer, creating beautifully unsettling sculptures. Affirming the vital roles of women and nature, grasping claws symbolize endemic danger, while birds serve as confidants, spies, and foot soldiers in the struggle for justice. 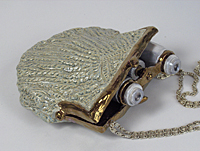 The mixed media assemblage process takes months and hundreds of hand sculpted or altered objects. Weaving together porcelain, metal, clay, resin, and plastic upon a wooden base, followed by a complicated painting technique, results in ethereal, porcelain-like sculptures. Jill Gibson was born in California, studied painting at the Art Student’s League NY in the late 60’s, lived in Italy and Mexico, and shown her work nationally and internationally. 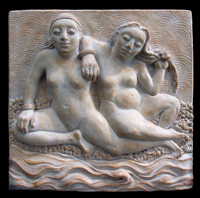 She’s been working with clay and concrete bas relief sculptures for 12 years. Jill : “A small spontaneous sketch is born. I dress that inspiration with form, texture, and light, I multiply it many times, thus becoming an exchange of energy with the world. Female figures, animals, plants, seeds, fabric, windows, horizons, water, vessels, wind, earth, sky, act as metaphors for energies within.” She works in Marin, CA with various mediums that in turn influence her images. Mexican border town culture, three years of childhood spent in Iran during the early 1960s and the Greek heritage of her father's family have all been active influences in Mirto's creative endeavors. Everything hearkens to strong color, coupled with an effusive and mystic intent. The state of being human--the state of the heart; all striving to be accomplished with very humble elements, discards and sticks found on the ground. I am inspired by the human form and the emotions that are conveyed through movement, gesture and facial expression. From the mother's embrace of her child, the stretch of the dancers' long limbs, to the withdrawn posture of isolation or pain. I try to capture that moment in time-that moment that tells the story. And just like dance or music, sculpture can tell a story without words. I arrived in Berkeley during the “Summer of Love”. I raised 4 children here, and for many years worked as a nurse. I have always expressed my creativity through sculpture, dance and art quilting. I am drawn to texture and form combined with narratives that focus on everyday life. 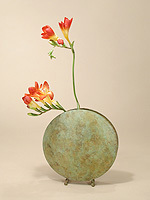 I work primarily in clay, especially raku. My series “Body Language” is a varied series of gestural figures, whose posture and attitude defines them. Although the figures have no discernible facial features the viewer is able to relate and make assumptions about these “guys” and what they are about. As with my “Town Folk” series, I like the viewers to have their own interpretations and emotional responses and touch people in different ways. I am a painter and a sculptor. Whatever medium I work with I push it and myself beyond the traditional boundaries. The process for my two-dimensional abstract artwork begins by producing a clay monoprint that is transferred onto geotextile, mounted on a board to which I add mixed media. As a sculptor I work as a carver combining unconventional materials such as clay with fabric and Polymer with silk.